Genius Gyms is proud to announce its entry into the UCSD Incubation Program for Innovation and Entrepreneurship. On Friday September 23rd, University of California San Diego announced the acceptance of Genius Gyms into its prestigious program focusing on technology, innovation and entrepreneurship. Genius Gyms co-founders Sarah and Robert said “We are delighted about being accepted into this amazing program. We will now have access to best in class resources and we will be in a better position to develop our technology and get closer to achieving our goal of improving peoples lives affected by cognitive decline and brain disease”. Co-founders Sarah McEwen and Robert McEwen said “Our website is part of our commitment to help those affected by cognitive decline and brain diseases. This site is a stepping stone for us to communicate the progress we are making to help improve the lives of those affected by the above”. 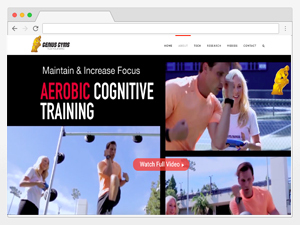 Genius Gyms hired Buzz Partner to build the site.